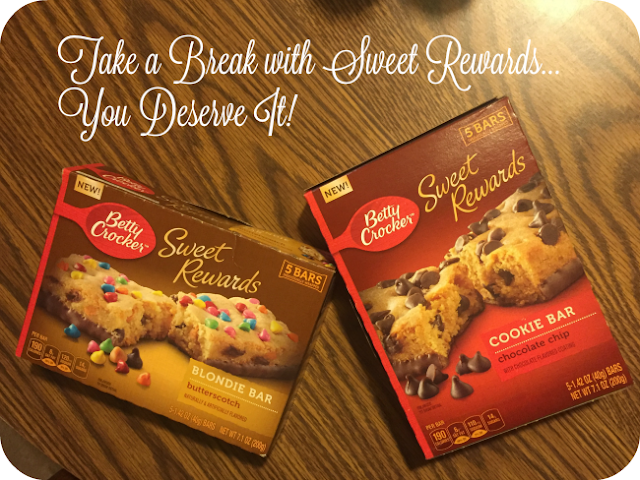 Take a Break with Sweet Rewards...You Deserve It! I mentioned in my New Year Resolutions that my word of the year was BALANCE. And this means taking some time for myself...it's part of our formula for happiness. Taking time for myself....what does that mean to me? Maybe I'll soak in a nice bubble bath, or go get a pedicure, or indulge myself with Betty Crocker Sweet Rewards bars. Yes, even when you are trying to lose weight, it is okay to treat yourself once in a while. Pure Indulgent bliss in a bar, Betty Crocker Sweet Rewards bars are a sweet new treat to cater to your cravings. You can find them at your local Publix in the cereal bar aisle. They come in three different flavors: Butterscotch Blondie Bar, Chocolate Chip Cookie Bar, and Caramel Brownie Bar. And right now, you can snag a $0.50 off coupon to score a great deal on these which makes the rewards even sweeter. I like to sneak my sweet little break after the kiddos are in bed. And I want one of you to try some Betty Crocker Sweet Rewards bars for yourself! Just let me know in a comment below which variety you are excited to try the most, then fill out the form HERE to be enter to win $25 PayPal cash. How do you get some me time? 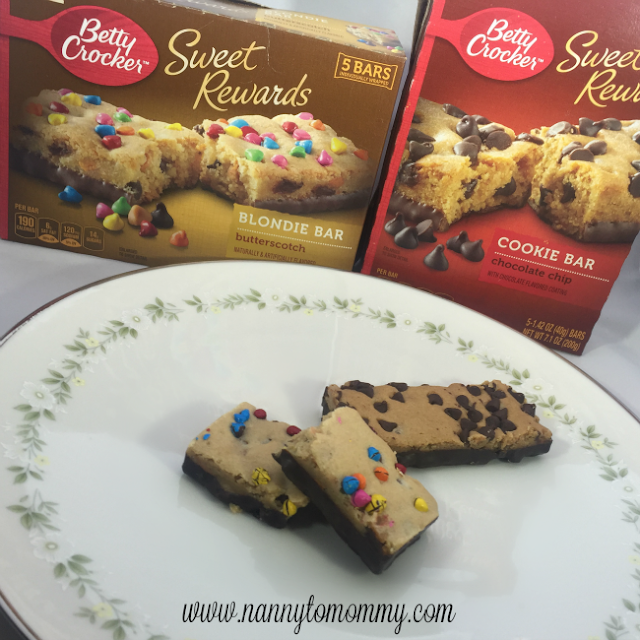 What do you think of Betty Crocker Sweet Rewards bars? Which variety are you most interested to try? This is a sponsored post on behalf of Betty Crocker. All opinions are my own. I am most excited to try the Cookie Bar mix. I'm most excited to try the caramel brownie!! Yum!! I would most like to try the chocolate chip cookie bar. I'll say caramel brownie is the one I'd most like to try. The cookie bar looks delicious! I'm excited to try the cookie bar flavor! These look so yummy--they are making my mouth water! I would be most excited to try the chocolate chip. These look great. I am most excited to try out the caramel brownie. And second the butterscotch blonde. I want to try them all really. I am most excited to try the butterscotch blonde. It sounds so good. The variety I am excited to most try is butterscotch blondie. I'd like to try the caramel brownie because it combines 2 of my favorite things! I'd love to try the caramel brownie ! I would love to try the chocolate chip cookie variety! They look so good! I really want to try the cookie bar. Sounds fabulous! Would love to try the Caramel Brownie. Now that I've read about them I am most excited to try the caramel brownie bar. I love brownies, so the caramel brownie. These look yummy. Caramel brownie sounds good. Perfect for my current craving. Oh I am most excited to try the Blondie Bars Butterscotch! They look so yummy! The butterscotch blondie bars look soooo good! I would really like to try the butterscotch blondie bars. Im pretty excited to try those Blondie bars!! They look amazing!! I would love to try the new Caramel Brownie bars. I like to try the Caramel brownie. I would like to try the Caramel brownie. I'm salivating just looking at the cookie bar flavor. Can't wait until I get me a box of them! "Pure Indulgent bliss in a bar" Great way of putting it...they look that way. I can't choose; I want to try them all. Yum! I don't know...too many. I would like to try the caramel brownie. The cookie bar mix looks delicious! I am excited to try the Blondie Bar. Yum! These look good! I'd love to try the Blondies! I would love to try the Caramel Brownie! The chocolate chip looks really good! I am most excited to try the caramel brownie mix. I'll take anything with chocolate. Butterscotch blondies!! I want one now!! I would like to try Caramel Brownie Bar . I would like the chocolate chip cookie bar. The Caramel Brownie Bar because it combines my love of brownies and all things caramel. Butterscotch Blondies sound really good! The diet can start tomorrow, today I'll have a Caramel Brownie please! I think the chocolate chip cookie bar looks delicious! They all sound delicious, but I would most like to try the Caramel Brownie Bar. They all sound delicious but the caramel brownie bars sound delicious. As a caramel lover, I would love to try the caramel brownie! Looks delicious! Caramel Brownie Bar looks absolutely yummy! Thanks for the coupon! I can't wait to start eating them! I really want to try the chocolate chip cookie bar! Honestly I want to try them all!! I'd like to try the Caramel brownie! I think the cookie bar one looks very yummy! I would love to try the caramel brownie!! The caramel brownie sounds the yummiest. The flavors look dangerously delicious. I'd like to try the chocolate chip cookie bar the most. They all sound delicious. I'm most excited to try the chocolate chip. I would love to try the cookie bar. The caramel brownie bar looks delicious! Love a good ooey, gooey caramel center. I would like the chocolate chip bars the best. Those would be gone in a flash around our house. I am excited to try the Butterscotch Blondie Bar. I would love to try the butterscotch blondie bar! I love anything w chocolate it it! I'd probably go for the chocolate chip cookie bars! Or Caramel Brownie! That sounds soooooo good! I would love to try the cookie bar! I want to try that chocolate chip cookie bar (COOKIEEEEEEEE!!!!). The chocolate chip cookie bar sounds SO good. I'd love to make that when my friend visits in two weeks. I would love to try the Blondie Bar. I want to try them all. The Butterscotch Blondie Bar looks so good. The caramel brownie looks amazing. I'd love to try the Chocolate Chip Cookie Bar mix...sounds yummy!! I get some me time when my kids are in bed. I really like these Betty Crocker mixes. I would try them for the kids and me. The caramel brownie bars look super yummy. All of the flavors look wonderful. I would love to try the cookie bar. Has anyone tried it yet? Does it taste as good as it looks? Yes! It is delicious for real! I love almost anything with chocolate chips in it! The Sweet Rewards bars look delicious. I'd like to try the butterscotch blondie. I am super excited to try the Butterscotch blondie version. Now I will say that I have used BEtty Crocker brownies for years, and besides making them homemade myself, there is no brand that tastes as good. They taste less "preservativy"
I would love to try the chocolate cookie bar. cookie bar chocolate chip is for me! anything chocolate really! thanks for this! That Blond bar Butterscotch looks out of this world yummy ;) Iwould not mind trying those . I am most excited to try the Brownie Bar! When I escape from the house and get into the car to go to the store, I heave a huge sigh of relief! ME TIME!!! Those look yummy. I'd like to try the Caramel Brownie bar. Id love to try the blondie bar! blondies are my fav! I would love to try the cookie bar! It looks delicious. Oh, look at those Blondie Bars, mmmm! I'd like to try either cookie bar OR Caramel Brownie bar. The chocolate chip cookie bar is the one for me! But, I would like to try the Blondie bar second. I'd like to try the Blondie Bar. I'd like to try the caramel brownie bites! The Cookie Bar looks good! I like them all but the caramel browniewtempts my tummy. The butterscotch blondie bar looks so good! I'm most excited to try the chocolate chip cookie bar. They all look great. I really want to try the caramel. I would like to try chocolate chip bar. This is perfect for the spring, which is right around the corner. Nice and sweet.